Myself and my girlfriend bought Nexus 7 (2013) devices. Last week, I bought a chromecast from the US so we were all excited to get Netflix up and running. We could get no further than the above. Not even as far as the login screen. Cleared Google Service Framework cache and data. Did a full factory reset. I basically did everything short of flashing the device. I'd pretty much given up on Netflix completely until a trip to France this week. For the craic, I tried Netflix from my Hotel. I was VERY surprised to find that I could get to the login screen! Of course, since Netflix isn't available in France, I couldn't get beyond that point. Anyway, my girlfriend's Nexus was still showing the error above. Here's what I did to resolve the issue for her. To set a DNS IP manually, you must go to your network's advanced settings and choose "Static" for IP Settings. 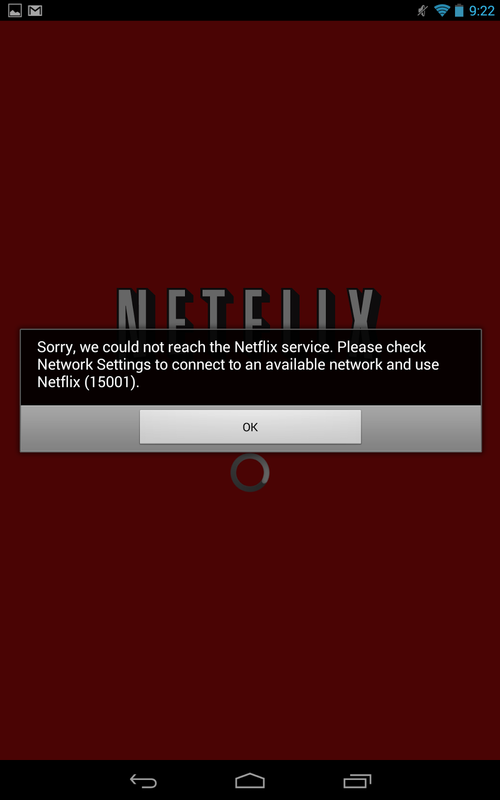 Once I'd done this, I launched the Netflix app, which got as far as the login screen. I then went back and set the Network option to DHCP again. Launching the Netflix app again, I was brought to the login screen without issue and could finally log in to use Netflix with the chromecast. It's an absolute farce that I had to trick a service that I've paid money for into thinking I was in a different country just to use it! 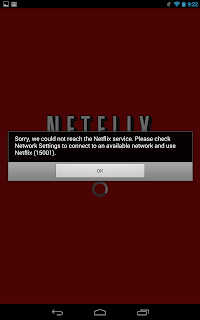 Netflix really need to sort their android development out! Thanks for the fix! The DNS server you listed didn't work for me, but 109.69.8.51 (found via http://pcsupport.about.com/od/tipstricks/a/free-public-dns-servers.htm) did. Also, you get to advanced network settings by long-tapping your network's name (which took me embarrassingly long to figure out). Thanks for putting these instructions out there, they were really helpful! I got my problem solved without using any of the steps above or the steps Netflix had in its website in the help section. It was an instant fix. Step 1, uninstall Netflix app. Step 2, power off the phone and then boot the phone into bootup setup. In Samsung press the home key, power button and volume up button simultaneously. There will be an option to wipe cache partition. Once complete, restart the phone and install Netflix app. Worked first time. Easy peasy. If you have s different phone, the method to get into the boot setup may vary. You will need to find out how to do it this September on your device. Good luck! Sorry, but there is nothing "instant" about uninstalling the app, wiping the cache and re-installing the app. It definitely sounds like your issue is completely different to the one described here and even more likely so since mine happened 4 years ago.